On December 24, 1968, after a four day trip, the Apollo 8 astronauts arrived at the moon. This photo of Earthrise over the lunar horizon is one of the most famous images returned from the space program. It is the earliest image we have of planet Earth as seen from deep space. It also records the first time in history that human beings left the earth’s orbit. In a historic live broadcast that night, the Apollo 8 crew took turns reading from the Book of Genesis, and closing with a holiday wish from Commander Borman: "We close with good night, good luck, a Merry Christmas, and God bless all of you -- all of you on the good Earth." William A. Anders, Apollo 8. 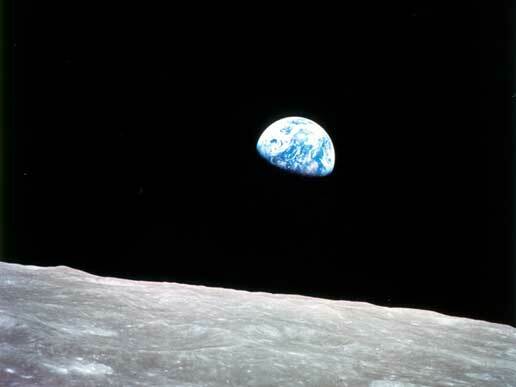 Earthrise – 1968. National Aeronautics and Space Administration, NASA photo ID 54428. Accessed 6 August 2010.